Let’s face it, we all love candy! But, it is also nice to have an alternative. Halloween is fast approaching. It’s time to get some ideas in the trick or treat bag! Here is an option that is healthy and easy to make! 2 cups pumpkin, butternut or Kabocha squash seeds. Preheat your oven to 325 F. Cut open your pumpkins. Scoop out the seeds. Wash and rinse well in a strainer to remove all pulp and stringy bits. Pat dry with a kitchen towel. Let sit for a while so that there is no remaining moisture. Warm oil in a large skillet, over medium heat and sauté the pumpkin seeds until lightly golden, about 3 minutes. Add the New Zealand Multiflora Honey and stir with a rubber spatula. 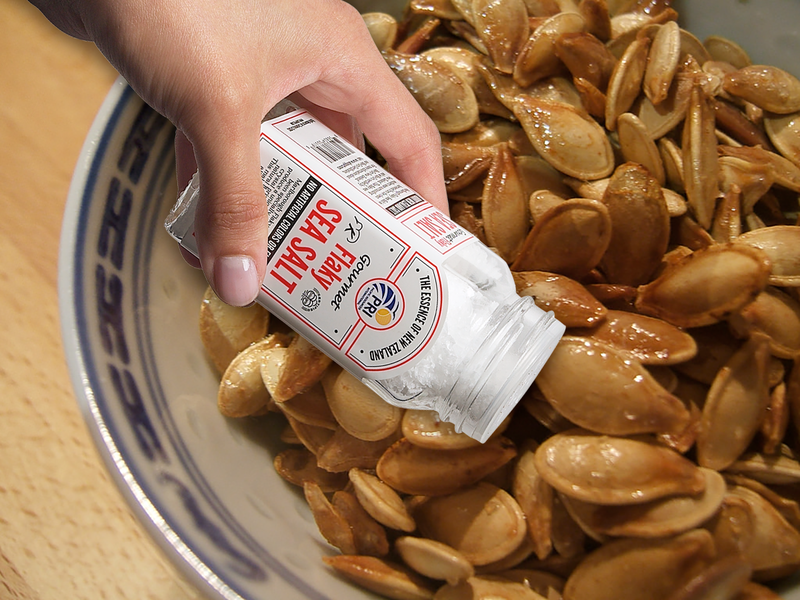 Transfer the seeds to a greased flat cookie sheet, place in the oven. Roast for about 20-30 minutes, stirring occasionally so that they do not burn. They should be crispy throughout, and not soft in the center. Continue to cook if necessary. Once finished, cool the seeds on a cooling sheet. While hot, sprinkle with BioGro Certified Pacific Seal Salt to taste. If desired, put in little gift bags for trick or treating.